Libya’s rich cultural heritage is being supported by a $2.26 million two-year project to conserve historic sites, establish conservation laboratories and train more security staff to protect the country’s treasures. Roni Amelan, a spokesman for UNESCO, told Libya Herald that projects would focus on training for the benefit of heritage professionals, including support staff and, in particular, security guards. “Priority will be given to the physical protection of cultural heritage sites and museum collections,” Amelan said. 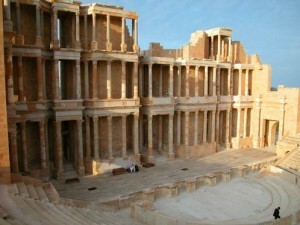 Improving the protection of Libya’s heritage sites and valuable collections of antiquities is of pressing importance. There has been a number of incidents of vandalism and theft from archaeological sites and museums. Such thefts were ongoing long before the revolution. In 2006 the BBC reported that at least 90 important items had been stolen from Tripoli Museum since 1988, due to inadequate security. Two valuable statue fragments have been returned to Libya from Europe this year, having been recognised as stolen. Libya has five UNESCO World Heritage sites: Cyrene, Leptis Magna, Sabratha, the ancient town of Ghadames, one of the oldest Saharan cities still standing, and the rock-art sites of Tadrat Acacus. This latest project, however, will extend to local museums and artefacts. “Activities will centre on museum management, conservation of built heritage, conservation of movable property, site protection and management,” Amelan said, adding that conservation laboratories would also be established in the country. Amelan said that the comprehensive programme, jointly-funded by the Libyan and Italian governments, would be run over the course of two years, in cooperation with the Department of Antiquities.